Alexandria Ocasio-Cortez has come to the defense of her fellow freshman Congresswoman, Rashida Tlaib, who is under fire for saying ‘we’re going to impeach the motherf****r,’ a reference President Donald Trump. 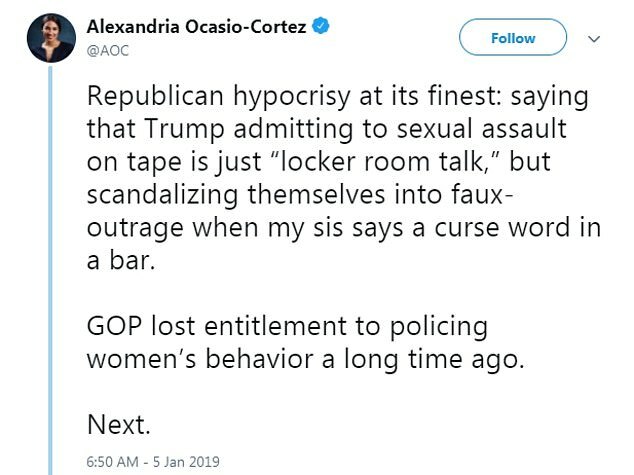 ‘Republican hypocrisy at its finest: saying that Trump admitting to sexual assault on tape is just “locker room talk,” but scandalizing themselves into faux-outrage when my sis says a curse word in a bar,’ Ocasio-Cortez tweeted on Saturday. ‘Locker room talk’ was how Trump explained comments he made on a hot mic over a decade ago while filming an Access Hollywood segment. While speaking to correspondent Billy Bush, Trump bragged about groping women in their private areas. Tlaib and Ocasio-Cortez, both Democrats, were sworn in as members of the House of Representatives this past week for the first time. 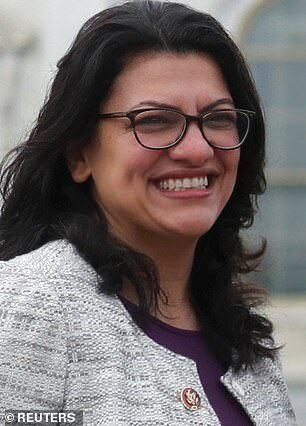 Tlaib represents Michigan’s 13th District, which includes parts of Detroit as well as some surrounding suburbs. 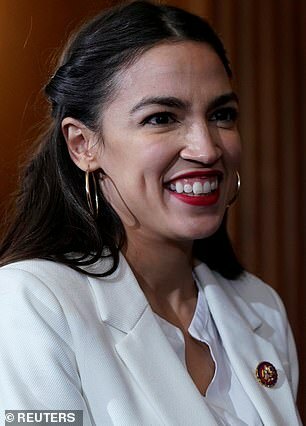 Ocasio-Cortez represents New York’s 14th District, which encompasses parts of Queens and the Bronx. 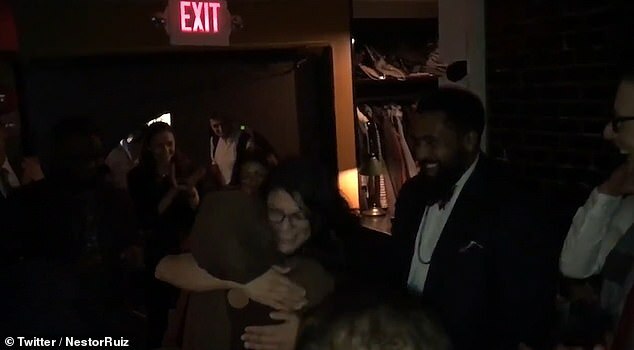 Tlaib is the first Palestinian-American woman in Congress, and dropped her F-bomb at the president during a party Thursday night hosted by the liberal group MoveOn. 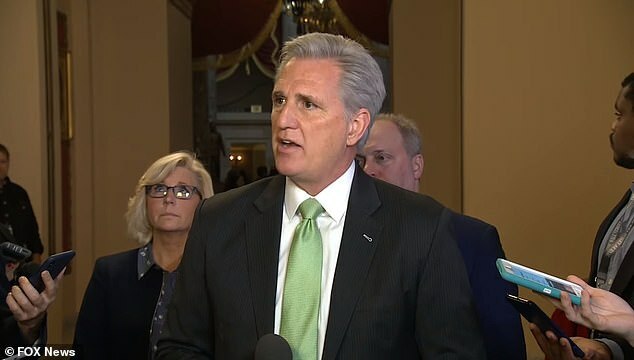 Republican House Minority Leader Kevin McCarthy blasted her on Friday, and slapped at House Speaker Nancy Pelosi for not publicly disavowing the slur. ‘Are the House majority going to be serious about anything?’ he asked reporters. Pelosi had told an MSNBC audience minutes earlier that she was ‘not in the censorship business,’ claiming Tlaib’s words were no worse than President Trump’s typical vernacular. Tlaib refused to back down in the face of criticism. ‘I know that if I was a man it might have been differently,’ she told CNN affiliate WDIV-TV in Detroit on Friday. ‘I know that, for me, I’ve always been this way. ‘I mean, I think no one expects me to be anything but myself, the girl from southwest Detroit with a little sass and attitude. ‘I think, you know, President Trump has met his match,’ she said. A day after taking her seat in Congress, Tlaib tweeted: ‘I will always speak truth to power. #unapologeticallyMe. ‘This is not just about Donald Trump,’ she claimed. She didn’t specify what constitutional crisis she was reacting to. ‘I don’t think we should make a big deal of it,’ she declared. McCarthy, usually calm and unflappable, was visibly agitated as he spoke with journalists on Capitol Hill. ‘How do you work with anybody if this is what they really have planned? That they go down into a place, they have the MoveOn, they think others aren’t watching it, they’re using foul language. They introduce that they just want to impeach the president. Over what basis? We have government shutdown right now. Where are their priorities?’ he asked. ‘We watched a brand new speaker say nothing to her. … That action should not stand,’ McCarthy vented. Tlaib had penned an op-ed for the Detroit Free Press alongside John Bonifaz, a constitutional lawyer and founder of the ‘Impeach Donald Trump Now’ campaign, in which the pair issued the same demand. ‘President Donald Trump is a direct and serious threat to our country,’ they wrote. The pair also dismiss the idea of waiting for Robert Mueller to finish his investigation before beginning impeachment proceedings, and say it would be a betrayal of the American people to wait until the 2020 election to unseat him. ‘This is not just about Donald Trump. This is about all of us. What should we be as a nation? Who should we be as a people?,’ they said. ‘In the face of this constitutional crisis, we must rise. We must rise to defend our Constitution, to defend our democracy, and to defend that bedrock principle that no one is above the law, not even the President of the United States. Her fiery remarks came as fellow California Democrat Rep. Brad Sherman used his first day in office to file an impeachment resolution against Trump. Sherman introduced an identical bill in 2017, charging that Trump obstructed justice when he fired FBI Director James Comey just months after moving into the White House. 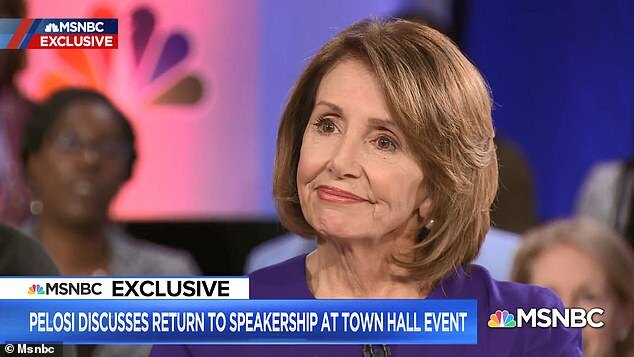 Pelosi told the ‘TODAY’ show this week that she doesn’t want to see an impeachment ‘for political reasons,’ but cautioned that politics also won’t prevent her from calling a vote if it’s justified. A Politico/Morning Consult poll in November found that just 33 per cent of voters want Trump impeached. But 61 per cent of Democrats are eager to see it in 2019. A December Harvard CAPS/Harris poll found 39 per cent of voters want to see the president fired. Pelosi also stepped up pressure on Trump after passing a spending bill that would end the government shutdown but without including $5.69 billion for his border wall. She said Trump and Senate Republicans should ‘take yes for an answer’ and approve the border bill, which was virtually identical to a plan the Senate adopted on a voice vote last month.